Arterial aneurysm. 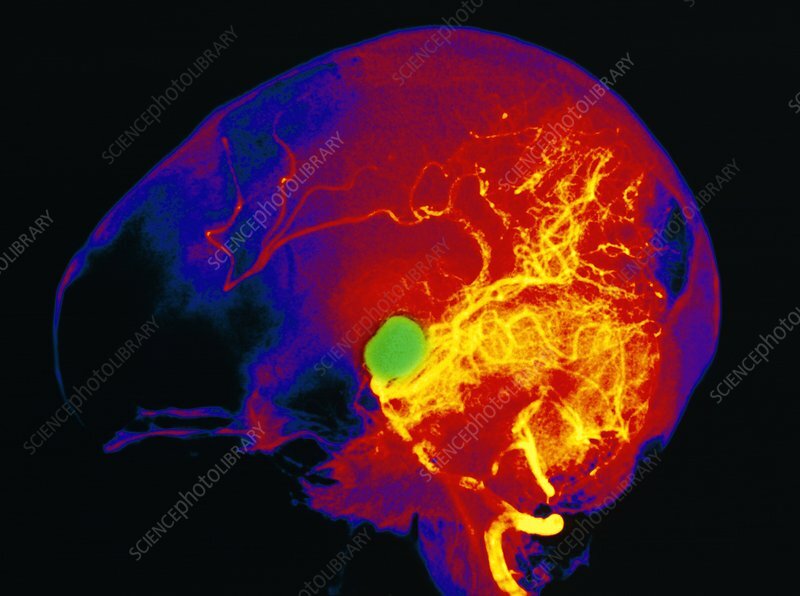 Coloured cerebral angiogram showing the vertebral artery with a large aneurysm (green). Arteries are coloured yellow. An aneurysm is a balloon-like swelling resulting from the dilation of a thinned section of arterial wall. Cerebral artery aneurysms are most often the result of elevated blood pressure (hypertension). The rupture of an aneurysm in the brain is one cause of cerebro-vascular accident (CVA, or 'stroke'), which normally results in some degree of paralysis. Treatment often involves arterial surgery. Angiograms are made by taking an X-ray of a patient after injecting the bloodstream with a substance opaque to X-rays.